Truly one of my favorite side dishes! My mother always makes these for me when I come home. So when I finally got the recipe of course I had to play with it. I’m sharing her recipe here but have also shared a few ways to schooz it up a bit as well. Thanks Connie!! Heat the EVOO in a large sauté pan over medium heat. 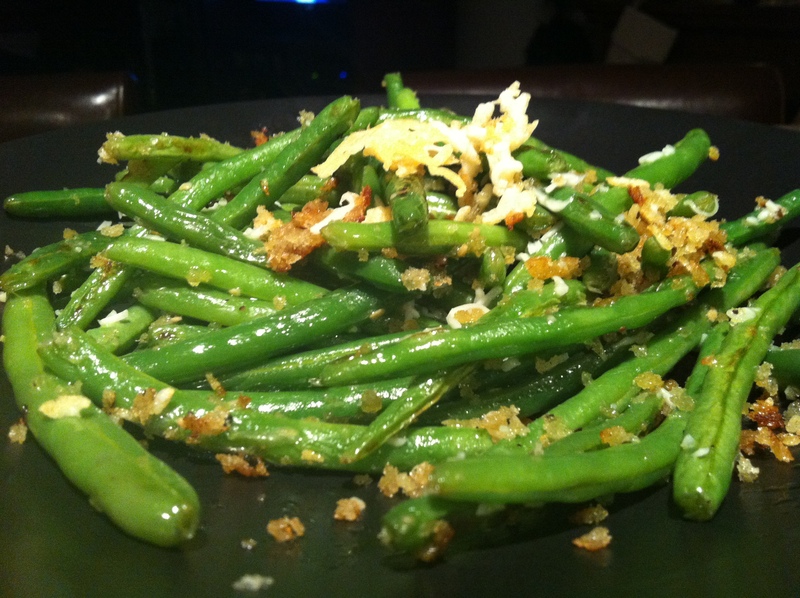 Add the green beans and sauté for 2 – 3 minutes. At this point they should begin to turn a vibrant green color. Add the garlic and sauté for another minute. Add a few tablespoons of water to the pan, cover and continue cooking for another 2 – 3 minutes. The beans should be cooked al dente and should still have a slight firmness to them. Remove the lid, add the panko and season with salt and pepper. Serve the beans while warm. They go perfectly as a side dish with just about any chicken or poultry dish. The day I tested this, I served them up with chicken salad sammies. A little lemon zest in the panko (about 1 tsp) brightens up the veggies beautifully! Try adding a tablespoon of parm for a cheesy salty kick. For a wickedly delish treat, swap out 1 Tbsp of EVOO for bacon grease. Seriously yummy! Thank you! 🙂 EVOO is short for Extra Virgin Olive Oil.